Cumberland County is a county in the State of New South Wales, Australia. 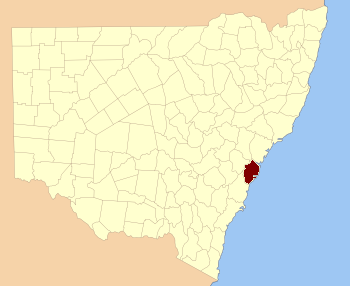 Most of the Sydney metropolitan area is located within the County of Cumberland. 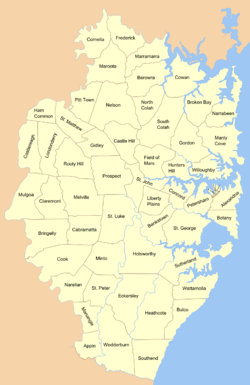 The County of Cumberland stretches from Broken Bay to the north, the Hawkesbury River to the north-west, the Nepean River to the west, the Cataract River to the south-west and the northern suburbs of Wollongong to the south. It includes the area of the Cumberland Plain. The name Cumberland was conferred by Governor Phillip in honour of Ernest Augustus, Duke of Cumberland, later King of Hanover, at a gathering to celebrate the birthday of his father, King George III, on 4 June 1788. The county has been marked on maps since the start of the colony, as shown along the key on a 1789 map describing Port Jackson as being within the county of Cumberland. In the nineteenth century, parts of the county were in the South and North Riding electoral districts from 1856 to 1859, which were replaced by Central Cumberland. There was also the Cumberland Boroughs electoral district. New South Wales is divided up into 141 counties, for the purposes of surveying and the registration of land titles. Few Australian counties have ever had any government or administrative function. However, the County of Cumberland did have a county government, the Cumberland County Council, from 1945 to 1964. Its responsibilities were primarily limited to town planning on the metropolitan scale. The Cumberland County Council was not elected by the people, but rather was elected by councillors of the various local governments within the County. In 1951 the Council ratified the Cumberland County Council Planning Scheme which boldly reformed town planning throughout metropolitan Sydney. Though not all of the plan was implemented, much of it was, radically altering the urban form of Sydney and its suburbs. The objectives of the County Council were often in conflict with the aims of many State Government departments. For instance, the County Council's plans called for a green belt to encircle metropolitan Sydney, while the NSW Housing Commission wished to use much of this land to build new low-density public housing estates in areas such as Blacktown and Liverpool. As a result, the Cumberland County Council was dissolved in 1964. Its metropolitan planning functions were taken over by a new body, the State Planning Authority, which has since been superseded by a succession of state government departments. As of 2008 this government department is the New South Wales Department of Planning. Map of Cumberland County in 1840, showing 13 hundreds and 53 parishes. The four smaller parishes in Sydney city are not displayed. ^ "Names Search". Geographical Names Board of NSW. Archived from the original on 23 March 2007. http://web.archive.org/web/20070323234219/http://www.gnb.nsw.gov.au/name/search. Retrieved 2 April 2007. This page uses content from the English language Wikipedia. The original content was at Cumberland County, New South Wales. The list of authors can be seen in the page history. As with this Familypedia wiki, the content of Wikipedia is available under the Creative Commons License.